Birthdays are nature's way of saying eat more cake! So it was hubby's birthday last week and of course there had to be cake! 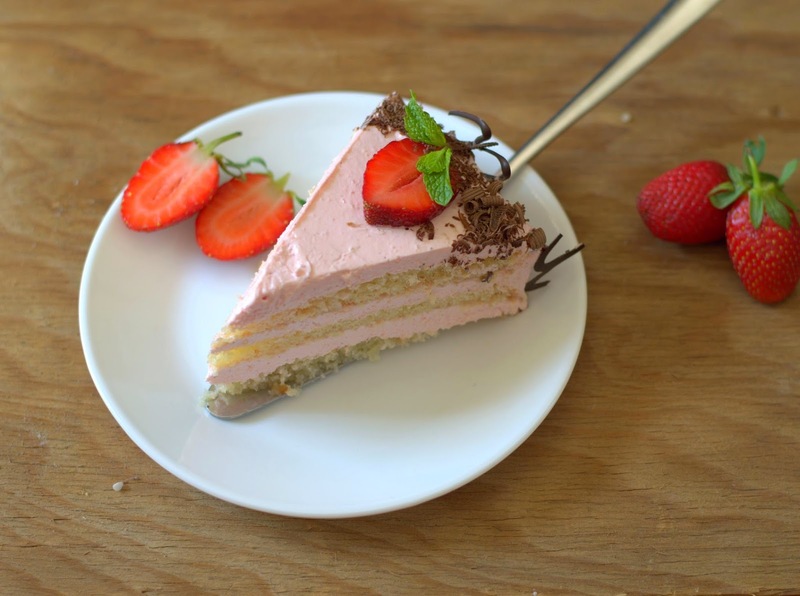 With the pretty blush of strawberries dotting the carts and supermarket aisles all around, a strawberry cake was waiting to happen. Baking layered cakes is fun but involves time and effort. Nothing that can't be planned ahead and spread over a couple of days to make it easier though. If you want homemade quark in the filling, pre-planning is absolutely necessary. I made the quark first (you will need at least 40 plus hours for this! ), baked the sponges later, struggled to get neat layers (and failed), made and filled the strawberry filling the next day. Let it sit in the fridge a good 16 hours and decorated it on the birthday. 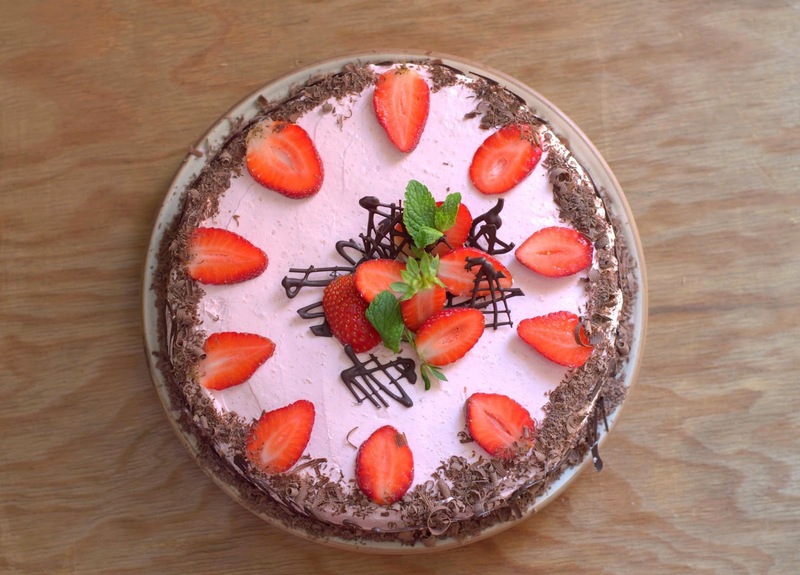 Turned out to be a light and moist, slightly tangy, relatively low fat Strawberry Quark Cream Cake we enjoyed. This sponge has been a favorite, one I have been using since ages. About time I stopped just saying and actually tried a new recipe ! Finally tried a slightly more substantial fat less sponge from Deeba's blog. The eggs are warmed over simmering water and then beaten, a touch of baking powder lightens the cake. Love these sponges as nothing soaks and holds up syrup better. If you are yet to try one of these, please do! I like having pieces of this cake in my freezer for trifles and would probably store whole ones too if I had a freezer big enough! Water (1 1/2 cups) and sugar ( 3/4 cup) heated together. Cool and stir in a bit of vanilla. Make more if needed. It would help to remember that it is most important to whip the eggs to the specified stage and so is folding in the flour right. The baking powder helps make the sponge lighter, a saving grace! I need more practice, it petrifies me each time! Watch this and this video of Rose Levy Beranbaum if you will baking this kind of sponge for the first time. Preheat oven to 190C. Line a 9'' (Deeba uses 8'' loose bottomed tins) round baking tin with parchment paper. Grease the bottom and sides, dust sides lightly with flour. Sift the baking powder, salt and flour together. Set aside. Place the eggs, vanilla and sugar in a large steel bowl. The bowl should sit snugly in a preferably heavy, sturdy bowl with a handle. I used my pressure cooker. The bowl with the eggs should not touch the hot water in the bowl below. Take off the heat. Using a hand mixer on highest speed, beat the eggs until they have tripled in volume, and become very thick and mousse like, 5-8 minutes. Sift 1/3 of the flour over the eggs, fold in with a large spatula or slotted skimmer gently till you see most of the flour disappear. Repeat with 1/3 more of the flour. Add the remaining flour and fold in making sure all flour is mixed thoroughly with no lumps. Please do watch Rose's videos for this technique. Turn batter into the tin (do NOT rap the tin) and bake for 25-30 minutes, until lightly colored and a tester comes out clean. If in doubt, err on the side of over baking slightly. Run a sharp knife around the sides to release the cake, immediately invert it on a rack, then re-invert so that the cake cools top crust up. When completely cool, trim the top and bottom crusts, cut the cake into 2 or 3 layers as needed. If you do not trim the crust, the syrup won't be absorbed well. Put all ingredients in a heavy saucepan. Cook on low heat for 5-8 minutes till the mixture is thick and syrupy. Be sure this is not watery as it will thin your cream. Mash roughly with a fork to keep it chunky or puree in a blender for a smoother puree. Place one layer of the sponge on a platter, brush the simple syrup over it, making sure it is thoroughly moistened or the cake will be dry. Dollop some cream in the center, spread evenly using an offset spatula. ( I will never learn this in a 100 years!!) Repeat with two more layers. Frost the top and sides. There are always chocolate collars to the rescue! Chill at least overnight or even up to a day to let the flavors meld. Decorate as you wish. Serve chilled. Please note : If making this sponge first time, it s a good idea to use the extra layer of cake to test how much syrup it will absorb. Brush and chill, top with some cream, chill for an hour or so, then check the taste and texture. Alter the amount of sugar in the syrup if needed. The sponge will be moist but not soggy or pasty. One of the layers here is very similar sponge from Roland Mesnier. Deeba's is easier and faster. The fresh strawberry puree lent a nice but subtle flavor and tang to the filling. If strawberries aren't quite your thing, just wait for the mangoes to arrive or use chopped ripe sweet kiwi fruit instead (do not cook either fruit). That should be delicious too! Adore strawberries and love tangy sweet ? Try this cake before the season is over! I liked the sponge too, a Tres Leches next perhaps? the cake looks so beautiful.What can we use instead of quark cream? Thank you Mayuri and Sooriya! You can use just plain whipped cream or mascarpone with the puree. 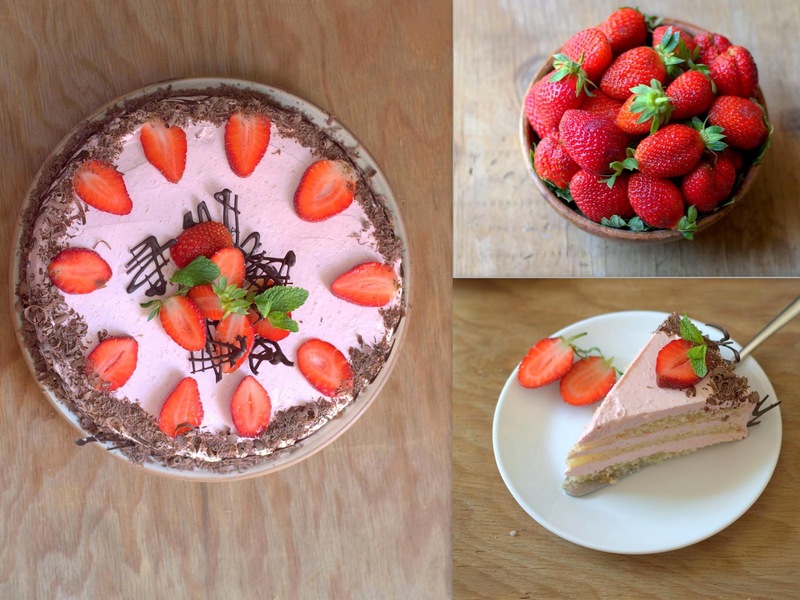 Looking yummy; strawberry cake . 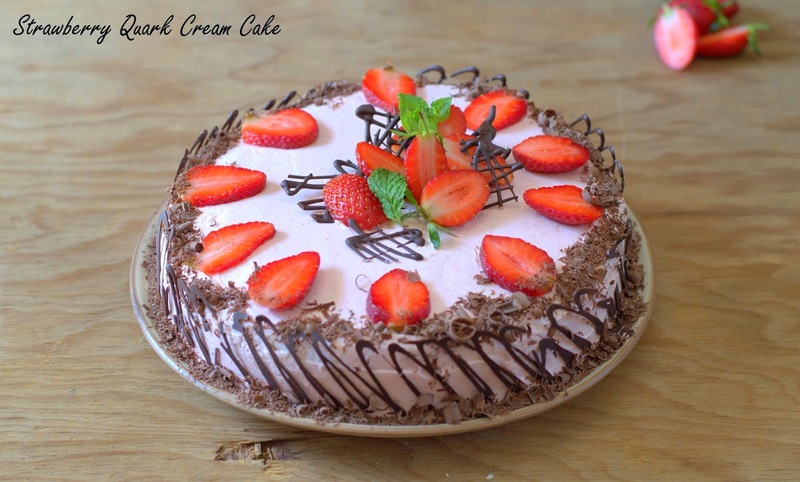 Strawberry is my favorite flavor so I am going to try this cake. its regarding use of egg in cake , is dere any option that can replace eggs in ur recipe , becoz i dont use egg but ofcousre wanna have nice moist cake.